I saw this really thoughtful YouTube clip a while back, and wanted to record it here, so I can refer people to it in the future. If you haven’t seen it yet, take 3 minutes and watch it. It makes me feel very fortunate, I love writing software. We won the Deloitte Fast 50 Rising Star! In non-software-development news, I’m very proud of our recent Deloitte Fast 50 Rising Star award and wanted to share the video with you all. Paul does a much much better job of explaining what exactly it is we do, than I do. So if you’ve ever been a bit baffled, now’s a chance to get a 2 minute overview. You get to see OrderPipe on the iPad in the video, chuffed to see software I’ve written getting some attention. Normal (geeky) service will resume now – I’ve been trying out the Nexcess Turpentine extension for Magento Varnish, and will report on results soon. Initial impression is positive. Tried out the @nexcess Varnish extension, seems very well done. github.com/nexcess/magent…If you’re struggling to get <1s page loads, get it. There’s been a few articles lately about what an open twitter-like network would be. A while back I was thinking about the same problem and how it could be implemented, so I wanted to throw my 2 cents in on the subject. My solution is super simple, does not require any new technology to be deployed, all it would take is a clear message standard, and clients to be created for a few popular platforms. So here’s my rambling thoughts on what I’ll codename OpenTweet. I wanted to put these down on paper so they stop rattling about in my head, and maybe someone would like to point out some issues with what I’m proposing too or add their own thoughts. Feedback invited. Firstly though, let me just say, what Twitter have created, the idea of a short, timely, but ultimately throw-away, 1-to-many unidirectional message is a powerful invention. The problem is that invention is held entirely by them and with the closing of API’s lately it’s becoming apparent that they intend to tightly control the access to it. That makes me uneasy. Continue reading An Open Twitter-like Network, Powered by Email. Just finished up with my API presentation at Magento Imagine 2012, thanks to those who came along, and for the interesting questions and discussions afterwards. Great conference so far and looking forward to more interesting tech topics. As promised here are the PDF slides, links to code examples and the blog post I mentioned that runs through the new Magento 1.7 REST API and oAuth. If any one has some comments or questions please do not hesitate to ask. Update: Videos of all the tech talks are up on the Imagine site, here’s mine. Thanks to everyone who twittered and took pictures during the talk, given the temporal nature of twitter, I’ll post a few tweets below for the archive. Ok I couldn’t resist, this made my day. 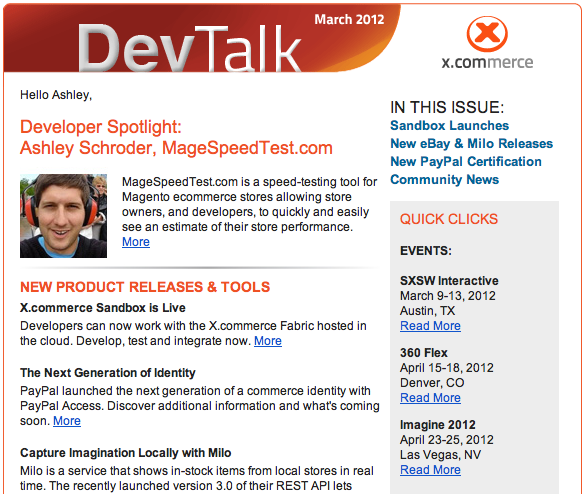 I was featured in the X.commerce DevTalk email newsletter talking about my Magento Speed Test site. My grinning mugshot made it in to inboxes worldwide, cool! You can check out the actual interview wherein I blather on about MageSpeedTest.com and how great it is and how everyone should be using it and how PayPal makes subscriptions easy, etc. So I’ll scour my archives for another suitably unprofessional photo of myself, this time with glasses on, I can’t see properly anymore, apparently. In other news, I’m presenting at Magento Imagine in April, so I’m busy preparing slides for that. Please ping me if you’re in the US, I’m going to do a trip around after the conference and would love to meet up with fellow Magento developers. Draft @magentoimagine slides starting to take shape. All these deadlines, it’s like being back in school! Also working on OrderPipe and a new multi-store Magento installation. I’ll have some articles to report on both over the next few weeks. Stay tuned.